My 7 year old daughter wants to be a healthy eater and she loves strawberries! Those juicy red gems are healthy, versatile and most importantly, delicious. While you’ll find plenty of berries in your local grocery store or farmers market right now, why not take an afternoon trip to a nearby pick-your-own farm and let your kids see just where those berries come from? That’s what Catherine McCord, the foodie mom behind the website Weelicious, did with her son Kenya on a recent trip to Kentucky. With a pile of fresh berries in her kitchen, Catherine came up with a new take on the classic strawberries and cream dessert. 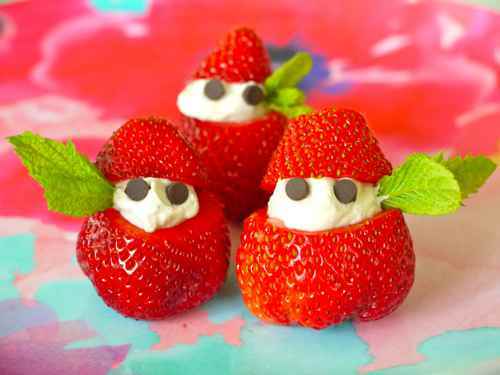 Her stuffed strawberry “elves” make a great afternoon treat for little ones and adults alike. Plus, the addition of mini chocolate chip “eyes” boosts the fun factor, which is a bonus if you’re dealing with a picky eater. My most favorite part it is super cute and super easy to make. You’ll find the full recipe for these adorable fruit snacks at Weelicious website. « How to make a Chalkboard from Dollar Store Platters with Homemade Chalkboard Paint-cheap, easy, and fun! They are adorable…and look delicious! I actually made these for this past Christmas! These are adorable!! The kids loved them (and so did the adults) and they made for a spectacular presentation!! What a creative way to get kids to eat fruit!